Atkinson, S., & Burden, K. (2011). Using the 3V Model to Explore Virtuality, Veracity and Values in Liminal Spaces (Pages 199-215). 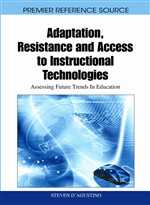 In S. D'Agustino (Ed), Adaptation, Resistance and Access to Instructional Technologies: Assessing Future Trends In Education. Hershey, PA: Information Science Publishing. It's been an interesting processes this one. We had a journal article rejected and I was beginning to wonder if this was just too 'left field' and whether anyone would engage with it as an idea. I'm still convinced that the 3V concept has an interpretive and evaluative value but it needs a professional conversation and that means at least getting it 'out there' in a form that can be referenced in the hope dialogue follows. Here's hoping.